Tina frames up a photo of son Ben. 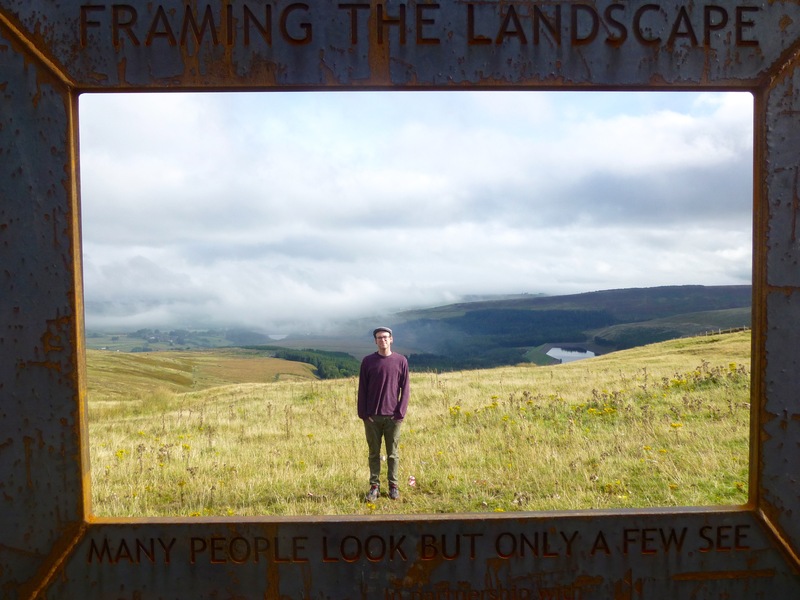 Some landscapes cry out for a frame to put them in, and the Peak District National Park in northern England supplies just the thing to make that happen. 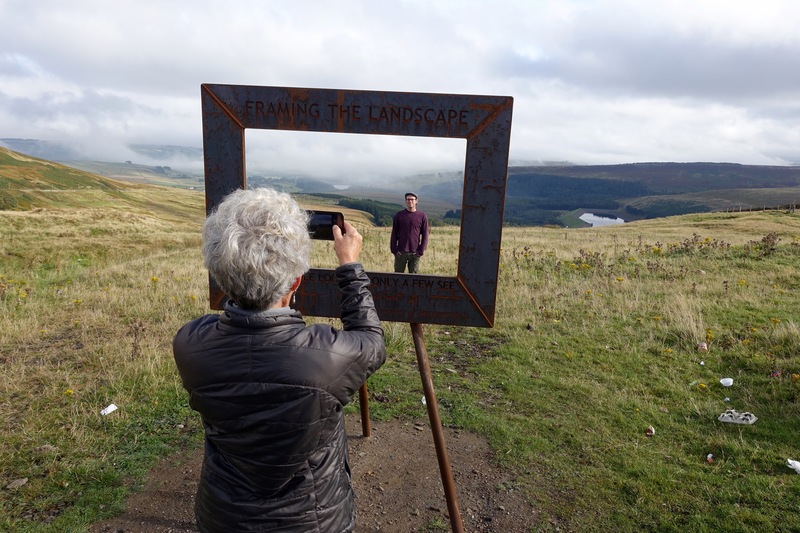 Tina framed her son Ben not long after we drove into the Peak District Monday after leaving Leeds. 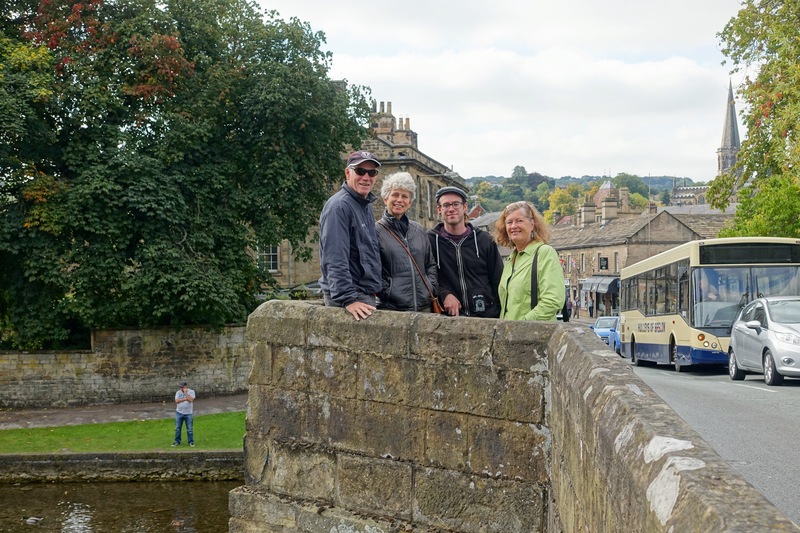 The plan for the day was to visit Holmfirth, a village on the edge of the district, then head down to Bakewell to try out the famous tarts that come from there. This was a recommendation by Joe Short, a native of Holmfirth and a young journalist I met on the media tour to Rugby School. After s quick stop in Holmfirth to prove to Joe that we did visit, we headed west to Glossop and then southwest to Bakewell, following the Ford Focus’ GPS system and wishing we had a map that would show us a view that extended past the next corner. The car park in Bakewell was packed, as was the town in general. That seemed strange for a Monday in post-tourist-season September until we turned a corner and walked into a busy open-air market. The lady in the cafe where we had lunch told us it was that crowded every market day. But the good thing was that we found a road atlas of the United Kingdom for sale at a book stall in the market — for two pounds, a bargain and a valuable aide for the rest of our travels. Heading for the market in Bakewell. 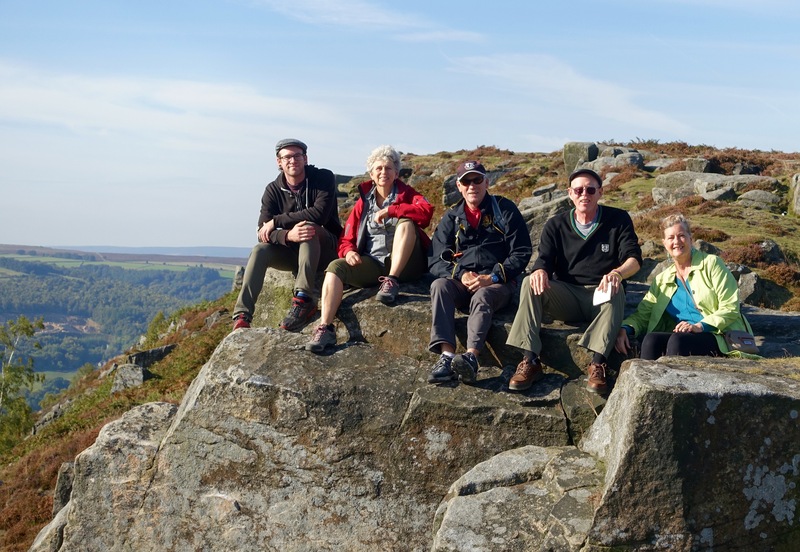 After buying our Bakewell puddings to go, we stopped at the National Park information office and got a recommendation for a hike: Curbar Edge. It meant backtracking a few miles but it was also one that Kathy had identified in a guidebook as a possibility. It was well worth the slight return north. The hike takes you high above the villages of Curbar and Calver in a 3 1/2-mile walk along the gritstone edge the area is famous for. 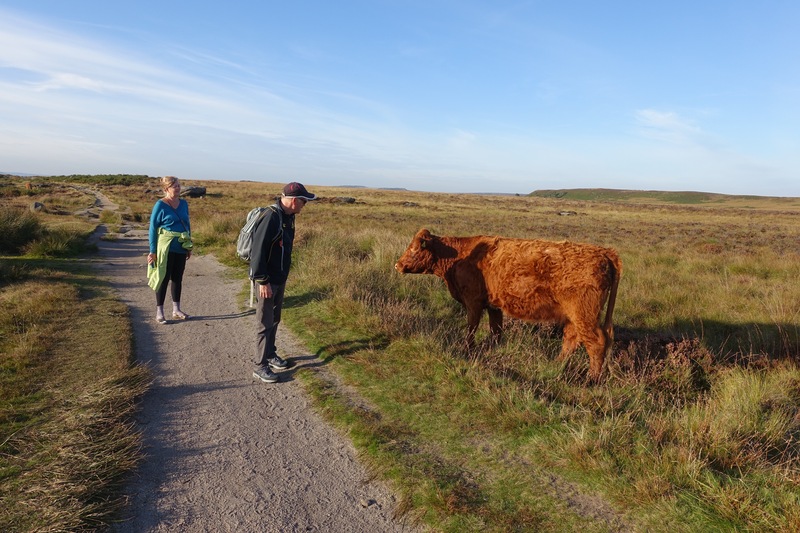 Hikers share the area with cattle, our favorite breed there the shaggy Highland cows. We were fortunate to meet a local gentleman walking his dog along the edge. He led us to a place just on the edge of the edge that you could walk right over without realizing that the configuration was a likely indication of something manmade. Our newfound guide told us the circle of stone around a depression was a gravesite dating back as far as 4,500 B.C. He pointed out where a break in the stones may have been an entrance to the site. 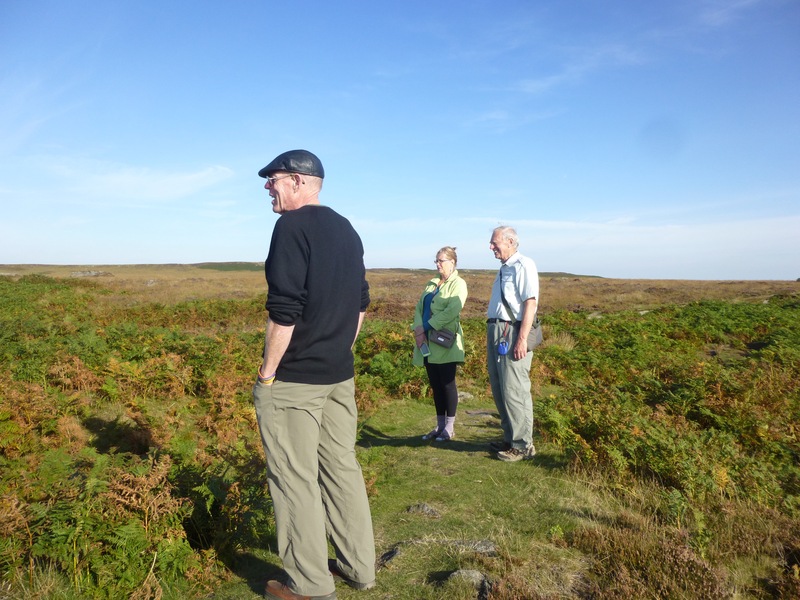 A local hiker tells us about an ancient burial site. We had intended for the hike to be a loop that would take us under the Froggatt Edge and then back along a trail under the Curbar Edge. We started down the trail to the Froggatt Edge, watched some rock climbers and tried to find the lower trail that would take us back through the woods. Never found it. So we had to walk back along the Curbar Edge one more time, enjoying the views from a different angle and meeting more dog walkers. Back at the car park, we set the GPS for Oxford and tried to figure out from our new maps where in the world the navigation system was taking us. There were many miles traveled on what the GPS identified as “unnamed roads,” which gave us no help in finding our place on the maps. Finally, we got back to the M 4 and a speedier return way to Oxford. Ben, Tina, David, John and Kathy — all on edge. Posted on October 4, 2015 by jbsaulPosted in TravelTagged Bakewell, Calver, Curbar Edge, Glossop, Holmfirth, Peak District, tarts.